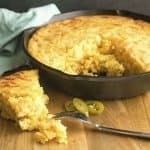 Cheesy Jalapeño Cornbread is amazing along side some Crockpot Cuban Black Beans or even better some Simple Chili! Yum. I love cheesy cornbread. 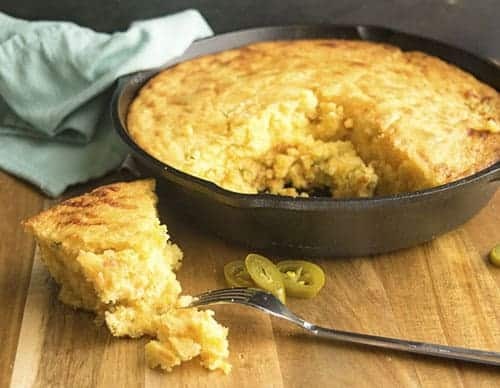 This is a sweet cornbread mix with some spicy jalapenos. I love the contrast between the sweet, spicy, and cheesy. It’s a little crumbly, but that’s okay. Actually this cornbread it super moist (sorry I had to use that word). The secret (my grandma always said) is to add a can of creamed corn. It keeps it sooooo MOIST (Haha! I know so many people who cringe at that word). To make this cornbread, dump all of your dry ingredients (flour, corn meal, sugar, baking soda, and salt) into a large mixing bowl. Then pour in the wet ingredients (egg, buttermilk, creamed corn, oil). Then mix together again. Pour the batter into a skillet or 8×8 baking dish. Bake at 350 degrees for 35-40 minutes. Then stand over the baking dish and eat a piece. Then eat another. Then cut a little bitty piece and eat it (no one will notice, right)…. 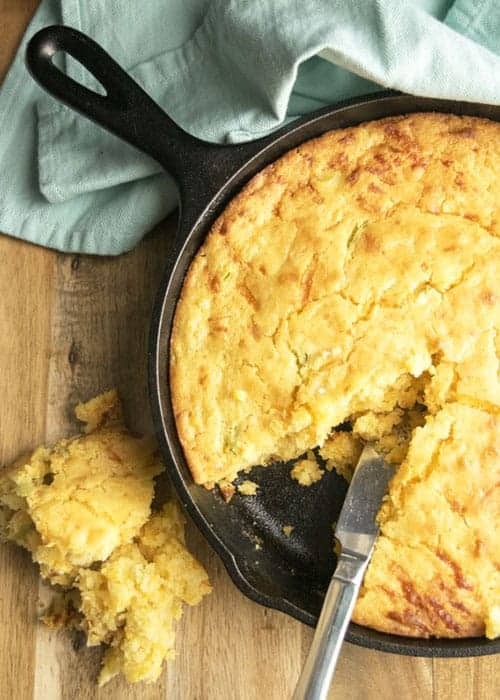 Cheesy Jalapeño Cornbread is a great side dish. 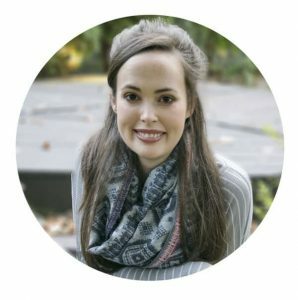 It pairs well with beans and rice or chili. 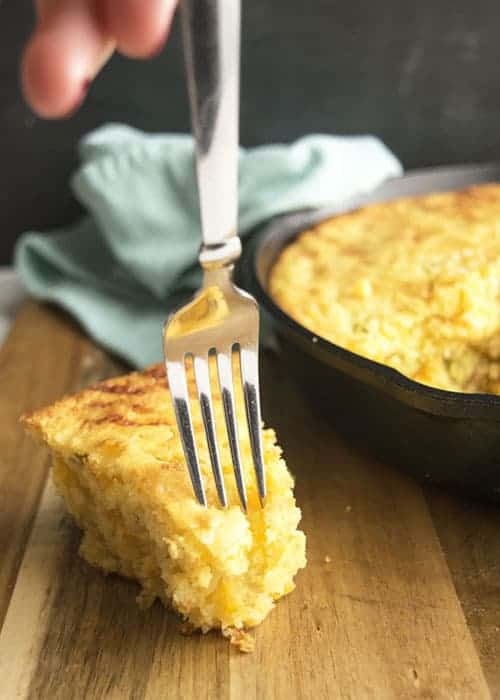 This cornbread is sweet, cheesy, savory and spicy! I love it. 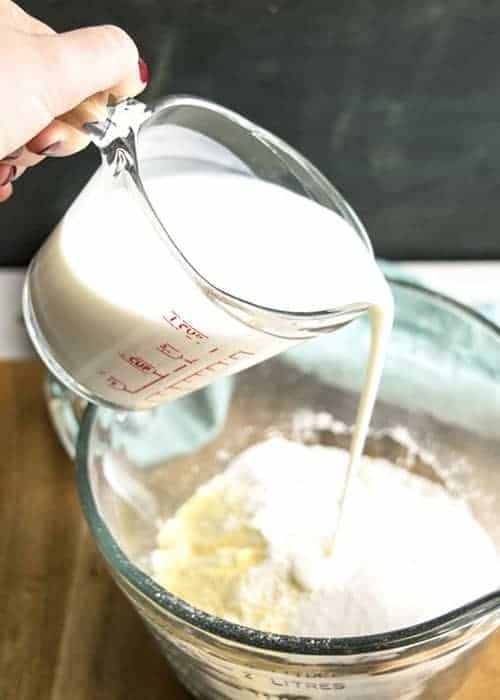 Dump all of the dry ingredients into a large mixing bowl (flour, cornmeal, sugar, salt, and baking powder). Mix the dry ingredients together. Add in the wet ingredients (egg, buttermilk, oil, and creamed corn). Mix everything together. Then add the cheddar cheese and jalapeños. 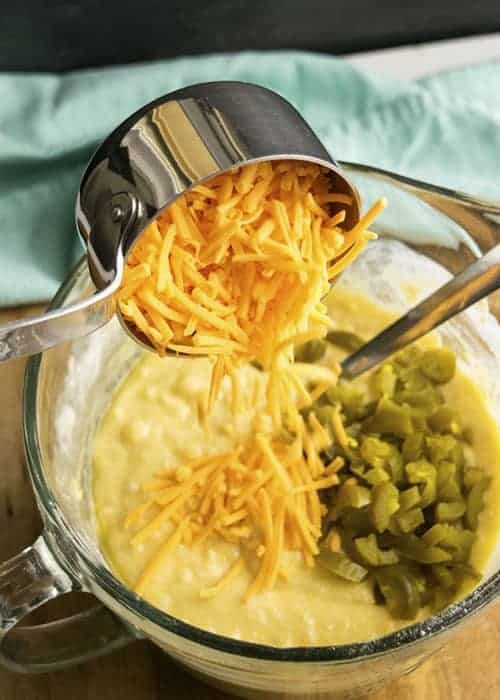 Mix together again, and the pour into a skillet or 8×8 baking dish. Bake for 35-45 minutes, or until the top has browned. You can also test the cornbread by sticking a knife or toothpick in it. If the knife/toothpick comes out clean, the cornbread is done.